Should I contribute to my RESP or RRSP? You are far from being the only parent to wonder if you should prioritize your retirement or child’s education savings. Which investment will really put your money to work: The Registered Retirement Savings Plan (RRSP) or the Registered Education Savings Plan (RESP)? And what if you didn’t have to sacrifice one for the other, what if you could receive the generous grant money offered for RESP savings and then the tax deduction of the RRSP? The truth is you can get the best of both worlds using the same investment, and it all starts with the RESP! Here is a well-thought-out savings strategy put into practice by a father intent on providing both a good education for his children and a comfortable retirement for himself. Cover both bases with one investment! Survey Methodology: The CROP poll was conducted online from November 14 to 19, 2018, using a sample of 1,000 Quebecers. Why should parents consider investing in an RESP before an RRSP or a TFSA? 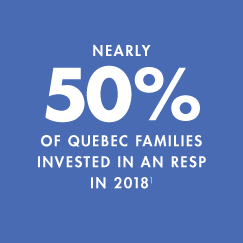 In Quebec, both levels of government offer generous RESP grants matching 30% to 60%2 of the first $2,500 invested each year. If you add the earnings from your investment and the grants, the RESP offers a return that’s hard to beat with another savings vehicle. 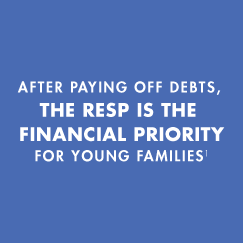 The RESP is an attractive investment that grows tax-free. In a number of years, when your beneficiary is ready to pursue post-secondary education, the amounts withdrawn as educational assistance payments (EAPs) will be taxable in his or her hands. However, since students benefit from lower tax rates, they usually pay little to no tax on these amounts. With an RRSP or TFSA, you often have to choose between performance and security, since few of these products guarantee your investment. However, it’s good to know that with a group RESP from Universitas Financial, your savings are guaranteed at plan maturity,4 whether or not your child pursues post-secondary education. 1. Methodology: The survey was conducted online by the CROP firm via a Web panel, from November 14 to 19, 2018, with a sample of 1,000 Quebec residents. 2. Canada Education Savings Grant (CESG) from 20% to 40%. Based on the adjusted family net income. The annual CESG limit is set at $600 and the lifetime limit is set at $7,200 per beneficiary. 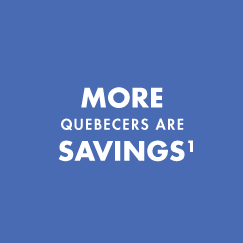 Quebec Education Savings Incentive (QESI) from 10% to 20%. Based on the adjusted family net income. The annual QESI limit is set at $300 and the lifetime limit is set at $3,600 per beneficiary. 3. Canada Learning Bond (CLB) up to $2,000 per beneficiary for a child born after December 31, 2003, from a financially eligible family. Certain conditions apply. See our prospectus. 4. Investments made in T-Bills and Government Bonds. The refund of contributions at plan maturity includes an amount equal to the sales charges of $200 per unit under the REFLEX Plan. Under the INDIVIDUAL Plan, the sales charge of up to $200 is not refunded. Certain conditions apply. See our prospectus.